Whether it was wheelchairs, snowmobiles or other products, said Gary Lemke, Edgar Hetteen always looked to make improvements. A lot has been written and said about Edgar Hetteen in the wake of his passing. The “grandfather of snowmobiling” started both Arctic Cat and Polaris, and for that he is fondly remembered, but many people don’t recall the role he played in lifting the entire snowmobile industry, not just those two companies. The recent passing of snowmobile icon Edgar Hetteen caused me to pause and reflect upon his contributions not just to snowmobiling in general, but to Trail-A-Sled, Inc. specifically. In 1959, Glen Gutzman, my father and I started a fiberglass fabrication business, specializing in motorized air-sleds. We named it Trail-A-Sled. 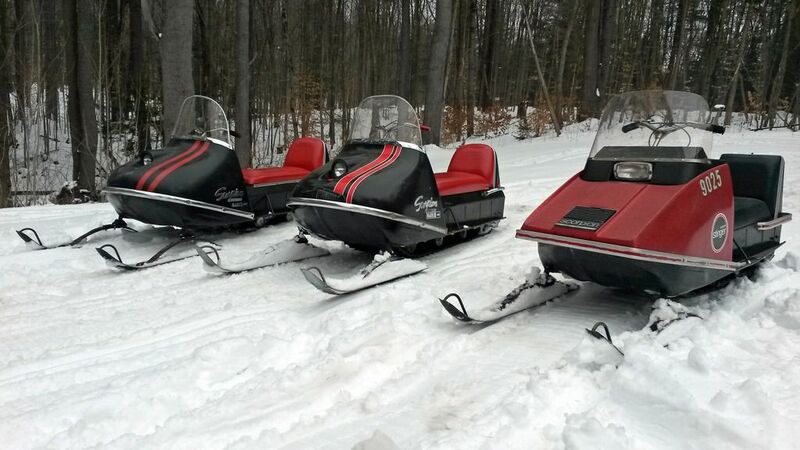 By the early 1960’s, Trail-A-Sled had a significant business relationship with Polaris Industries. We fabricated numerous fiberglass parts and had entered into a joint marketing agreement for our two-passenger air-sled design. In this 2008 image, Edgar Hetteen (right) is joined by Scorpion co-founder Richard Harrison (left) and Dave Guenther (center) of the Antique Snowmobile Club of America. Consequently, on numerous trips to Roseau I grew to know Edgar’s brother Allan quite well. By this time, Edgar had moved on to Thief River Falls, doing Lord knows what at the time. In the years that followed however, it became apparent that Edgar’s Arctic Cats were a substantive force in the burgeoning snowmobile industry. As Trail-A-Sled itself entered the snowmobile craze, both Polaris Industries and Arctic Cat became rivals, but we shared a common bond, together building an entirely new industry. It was a bumpy ride and the future success, which is now so obvious, was at that juncture far from certain. For Trail-A-Sled, our lowest moment came in November of 1967 when our flagship manufacturing facility was lost to a resin-fueled inferno that overnight, seemingly ruined our dreams forever. We at Trail-A-Sled and the community of Crosby, Minnesota were devastated. We’d lost everything, our books and records, parts and inventory, carburetors – the entire assembly line. It was the height of the manufacturing season and even if we could restart production, we lacked the critical assembly components to build a sled worth buying. However, in that moment, aid came from the most unusual of quarters. Despite being rivals, and depleting his own inventory, Edgar hurriedly provided us with a 500-piece shipment of highly valued Tillotson carburetors. At the time, Tillotsons in any number were nearly impossible to come-by. With his aid, and others, we were within days able to fashion a make-shift assembly line and begin slowly turning-out Scorpions once again – with Arctic Cat supplied carburetors of all things! At a time when a rival was on the ropes, Edgar was there for us, just like he was for so many others in this business. In the years that followed, snowmobiling was good to us at Trail-A-Sled. We were proud that our Scorpion product line was competing head-to-head with the likes of Polaris Industries and Arctic Cat but there was always a common bond between us, and that was of love for the sport and the need to nurture it beyond its infancy to a sustainable, accepted mode of winter-time transportation and fun. This included the appropriate trails, regulations, and community and governmental support. In this, Edgar was our common champion, our figurehead. His tireless advocacy of snowmobiling benefited everyone, not just Arctic Cat. I left the snowmobile business in 1970 and through the years lost touch with Edgar, and many of those early pioneers. However, in recent years I’ve become involved with the wonderful people leading the antique and vintage snowmobile renewal and through this association, was grateful to once again shake Edgar’s hand on several occasions. I learned of the Christian faith we share, his generosity, and the unwavering love of his beloved Hannah. I was also able, some 40 years hence, to once again thank him for those Tillotsons. I regret now that we didn’t spend more time reminiscing about those wonderful days. Something tells me that in due time, we’ll get a second chance.